Since there was a decent amount of interest in a coloring contest, I figured I'd give it a go. If you have any suggestions for future lineart, pm me. How the contest works: Each month a lineart will be picked. Color it in with whatever medium you choose. When you post your colored in lineart, make sure to say which medium you used. Contest will be open for most of the month. About the last week of the month the contest will close and voting will open. Whoever gets the most votes wins and gets a digital high five from me. 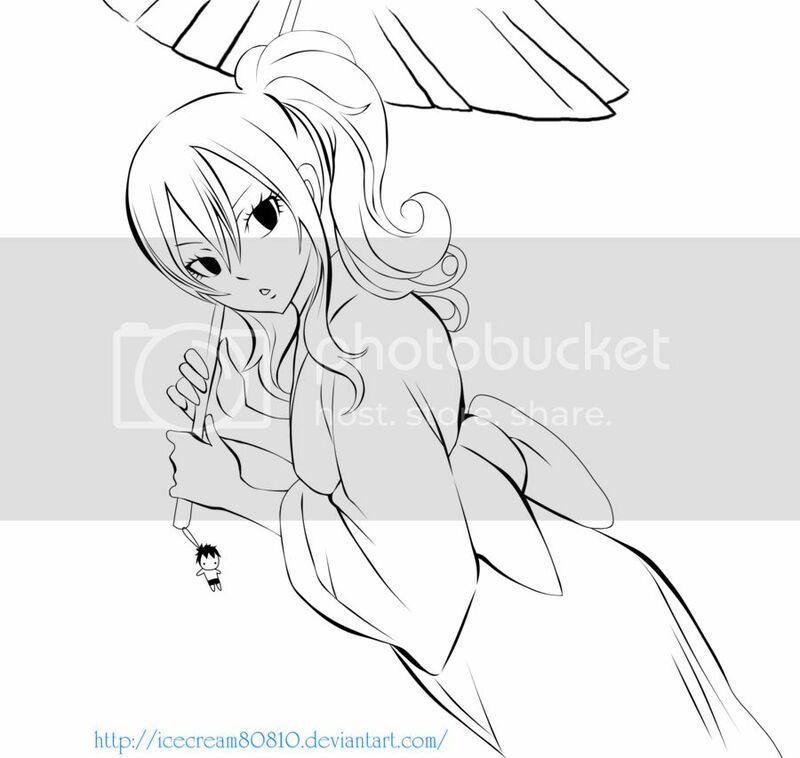 This month's lineart is Juvia from Fairy Tail. FYI this image should print fine. I might give this a shot. Let's see if my printer likes me. I'll try this out. 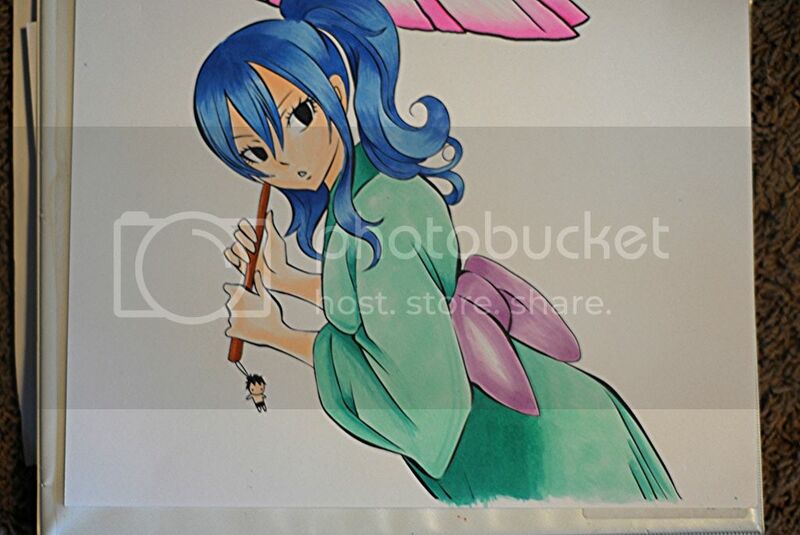 I have no idea who Juvia is, but I'll do it. Oh look, I forgot about this. I'll get right on it. Oh yay! A coloring contest! I've never seen Fairy Tail, but I'll color it! Cause I love coloring. Where/how do we submit it once we've colored it? Find a photo hosting site like photo bucket and upload it there. Then post the image url in this thread and the image will show up here. I'll get started as soon as I can. I used copic markers. Sorry the pic is a little blurry. I must profusely apologize that although I said I'd participate in a coloring contest, I have not produced an entry before the month ran out. I have excuses but you probably don't need them. If you want me to, I'll keep trying to make a late entry, but I can't guarantee I'll manage. By the way, that's a very nice job, nillapoet. I especially like the almost silky texture of the hair. I'm pretty sure I could not manage to do nearly so well. I didn't even notice this thread until now. Suggest these contests be moved to General to draw more attention. Would have participated last month. I forgot about the contest. Was caught up in many things going on and forgot. I apologize. Aaaaah, I managed to forget about this as well. April turned out to be a very hectic month. But as Midori said, no excuses. I will endeavor to do better next time, assuming you're willing to put up with us and do this again. Also, that picture is amazing! The lighting is perfect. I could not have matched those skills. I'll repost this in general.